Birthday ski ~ heading down Zoomer. My youngest child was born on a powder day to a family of skiers. It seemed apt, then, to celebrate her 5th birthday last weekend with a family ski outing. Last year I wrote about the many hours and days I had spent in recent winters on the pony slope, skiing in a snowplow, sometimes backwards, often with a kid between my knees or at least following close behind. I lamented the many times I had longed to be floating through powder or flying down groomed runs on my own. Paying my ski mom dues, I called it. Well, all that pony lift time has really paid off, and this year is a new winter of wonder. 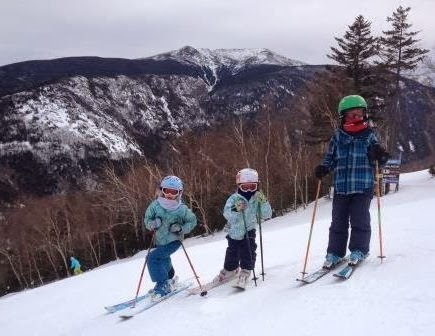 With all three kids happily occupied in Cannon Mountain’s seasonal junior program from just after breakfast to just before lunch each weekend day, I have reclaimed my freedom to ski with other adults (mostly other ski moms). And the kids have developed into fine little skiers and, thankfully, love sliding around on the snow as much as I do. My husband and I spent Sunday’s family ski time alternately leading and chasing our children down the slopes of our own childhood memories. Away from the snaking lines of their ski groups, the kids picked up lots of speed and showed us what they’ve learned this winter. My oldest daughter careered down each trail with gleeful grace, daring the rest of us to keep up. My son, once a backseat-hockey-crouch skier, now makes smooth, confident turns and – gasp! – pole plants. The littlest one cruised right along like a miniature ski racer, arcing from turn to turn, not a care in the world except going fast enough to stick with the bigger kids. From the snowfields above the Tramway’s summit station to the base area, our little skiers ducked into the trees – their “magic forests” – wherever they could, seeking fresh tracks and a feeling of adventure. I can remember sliding into those same magical, snowy, kid-sized hideouts when I was little and feeling the same joy I see now on my children’s faces. We let the kids decide which trails to ski, and each run they seemed to go a bit faster than the last. I was simultaneously terrified and proud when they zoomed in Super-G style turns down Turnpike, then dropped into kid tucks for the straight run out at the bottom. Not to be outdone, the birthday girl held the lead through the last turn. We had a blast, and I’m not sure there’s much that could make me as happy as skiing with my kids. Unless it’s skiing with my friends. And that’s the beauty of having paid my pony slope dues – and of having the kids in lessons every weekend. There is only so much my little skiers are willing to learn from Mom, so the lessons are for them. Really. But that time sans children also means I get to ski. With other grownups. Grownups who love to ski as much as I do (and don’t need help putting on mittens, zipping coats, and pulling up neck gaiters). For some of us, it is our first winter in several years with the freedom to ski at our own pace. We are still wrapping our winter-loving minds around that fact. We can take any trail we like, ski as fast as we want, and take extended coffee breaks when the skiing is less than stellar. Often, on these breaks, we run into people we know – folks whose now-grown kids we used to coach, or other parents whose little ones are still in tow. Those whose kids are older smile knowingly, remembering their own first taste of skiing freedom. The parents with kids younger than ours look at us longingly, wondering how many more winters until they’ll have the chance to ski with poles again and hang out in the lodge without dodging tantrums and coordinating ski-pant-clad toddler trips to the restroom. Often, at the end of the morning when I collect my children from their instructors, the kids want to ski more. And so we take some runs before heading home, cruising around favorite trails. If there’s enough snow, we head into the woods, whooping happily along the way. If it’s all hard pack, we ski fast cruisers. Sometimes the kids want to head to the handle tow – long the “pony slope” to me. There’s a mini park there, and they love to hurl their little skier bodies into the air, feel the wind in their faces and the joy of momentary flight. I’m content, those runs, to stand at the bottom, watching. No more pony slope for me, thanks; I’ve paid my dues there. Original content by Meghan McCarthy McPhaul, posted to her blog: Writings From A Full Life. This essay also appears as Meghan's Close to Home column in the Feb. 28, 2014 edition of the Littleton Record. I love the Olympics. Always have. Probably always will. I love competition of most any type, and the Olympics – when the best athletes from across the globe come together to compete on the world’s stage in sports from popular to obscure – seem the epitome of competition. Yes, there are always distractions, especially so in this Sochi Olympics of unfinished hotels, political unrest, and the regular claims of corruption. But, for me at least, the Olympics are about the athletes who have dedicated more time than most of us will ever know to chasing their Olympic dreams. Here, we see athletic grace and grit, strength and stamina, a bit of luck and plenty of determination as they strive to realize the Olympic motto: faster, higher, stronger. When I was a kid I dreamed of being in the Olympics. Probably a lot of kids involved in sports have similar dreams. I went as far as picking out a specific star on the American flag I would focus on as The Star-Spangled Banner played for my gold medal ceremony. I planned to sing along, and probably cry, too. I just wasn’t sure which sport to pursue to the Olympic level. While my Olympic dreams are long gone, faded without realization or regret, I still love watching the Games. I enjoy hearing a few of the Olympians’ stories, watching some of them realize their own Olympic dreams, whether winning gold or simply being a part of the show. I still love to watch the competition and be inspired in my own meagre athletic endeavors to be a bit faster, higher, stronger. As a young ski racer, I wanted to be fast like Tamara McKinney. When I started running track in high school, I adopted Carl Lewis’s manner of holding my hands stiff and straight while sprinting. I’m a total Olympic sap and have shed tears at many an Olympic moment – when Dan Jansen finally found gold in 1994, when Brandi Chastain scored the winning shootout goal in the inaugural gold medal game in women’s soccer in 1996, when Kerri Strug stuck her one-footed landing the same year. I’ve cheered for the Jamaican bobsled team and England’s lovable Eddie the Eagle and felt my own rush of adrenaline when Bode Miller nearly crashed, then miraculously recovered, in the downhill portion of the combined race in 2002. That winter, 2002, was my first back in New England, and I was working both as a ski coach at Cannon and in the Franconia Sport Shop the year Bode won his first two Olympic medals. Reporters started showing up around town, trying to figure out who Bode Miller is by wandering around the place he grew up. I liked to mess with them a little when they came into the shop asking about Bode. “Bode who?” I’d reply. I didn’t know him any better than they did – I just loved to watch him ski. Still do. It seems the whole town loves to watch Bode ski, to have a hometown Olympian to cheer on. Lucky for us, we’ve got a few 2014 Olympians in our region, including three who’ve honed their skills on Cannon Mountain: Bode in his fifth Olympics, Tyler Walker competing in his third Paralympics, and Julia Ford, a first-time Olympian who spent her final years before making the U.S. Ski Team training with the Holderness School and Franconia Ski Club on Cannon’s slopes. They join a long legacy of Cannon Olympians, stretching back to the earliest days of skiing on the mountain. And let’s not forget 2013 Burke Mountain Academy graduate Mikaela Shiffrin, who had her first World Cup globe on the trophy shelf – and plenty of podium finishes – before graduating high school. She’s a Colorado girl by birth, but there will be plenty of ski racing fans around here cheering her on these Olympics. It doesn’t seem to matter if folks personally know Bode or Tyler or Julia or Mikaela, we’re all rooting for the home hill Olympians. Banners go up on local businesses to show support and, sometimes – as the Games go on – relay congratulations. The news of their Olympic runs is shared at the Village Store and the post office, watched together at the bar or looked up on iPhones on the chairlift. We love the good stories behind the other Olympians, from other mountains, even other countries. But there is something special to knowing where the guy or girl you’re rooting for comes from. There’s a thrill in making turns on the same trails they have, even if theirs were faster and en route to skiing greatness. And every now and then, if you watch the smallest skiers on the hill, you’ll catch a glimmer of a new Olympic dream taking shape. Original content by Meghan McCarthy McPhaul, posted to her Blog: Writings From a Full Life. This essay also appears as Meghan's Close to Home column in the February 14, 2014 edition of the Littleton Record.